What Is Full Service Real Estate Brokerage? What Is A Discount Real Estate Broker? Traditionally, a discount real estate broker charges a lower commission that is relative to the services you choose. Depending on the particular broker you use, you may get a bundle of services comparable to that of the traditional broker, or you could get a scaled-down package with fees for additional services. You will get services comparable to that of the full service broker with me. Are You A Traditional or Discount Broker? Both. We offer both discount real estate services and provide full service real real estate services. We are local serving San Francisco Bay Area. You are not only getting subtantial savings but will be dealing with an experienced agent with local knowledge. There are some discount real estate websites that are not local, you may end up with an agent out of area and may not be experienced and your home may not get enough exposure to receive maximum offer. I heard that "Discount Real Estate Brokers" lower the buyers' agent commission and that no one will come to see my home because of it? In addition to the listing side fee, you will pay a percentage of the sales price of 2.5% which is offered to the buyer’s broker through the MLS at closing. You are fully aware of the amount of the commission being offered to the buyer’s agent. It is your choice and will be outlined in our listing agrement. The buyer’s agent is not informed of the amount of the total seller commission. And quite frankly, they do not care how much or how little you are paying Northern Crest Realty. Don't you have to reduce services in order to keep fees this low? We are able to keep the commission low because we have extremely low overhead and because we serve as both the Listing Broker and Listing Agent. we have a smart, efficient business model that works and saves you money. You are encouraged to compare our marketing plan and services to anyone else. Another agent said that they would go to town hall and pull all necessary property records. Would you do that? Absolutely. That is all part of the listing process. I visit town hall to pull a field card, permit records, plot map, septic maps, etc. All of this information is then assembled into a buyer take home packet and presented to buyers during the showing of your home. if you personally bring a buyer for my home, will I owe you buyers' side of the commission? What if I find a buyer during the listing? Lucky you, You just end up saving co-op fee of 2.5%. Your total fee is 1% in that case. we will still help you navigate the paperwork. Should I offer a “buyer agents” a commission? YES! We recommend offering buyer agents a commission of 2.5% of the sales price. Offering a commission to buyer agents will ensure they will show your home to all their prospective buyers. Will other Real Estate agents show my home to their buyers? YES! Your home will be listed in the MLS and since buyers agents will get their customary 2.5% commission they will bring them all! Will my home be in the MLS (Mutiple Listing Service) and Real Estate websites? YES! We are members of the local MLS and local and national board of Realtors. In addition we advertise with all of the biggest names in Real Estate! When you list your home with us, it will be listed in the MLS – (Multiple Listing Service) and in over 200 national and local websites! There is a Real Estate Company in my town with 800 agents, Wouldn't they sell my home better than you? Depends on the individual not the company. Independent small brokers have access to the same technologies that were available to big brokerages a decade ago. All agents as well as buyers looking to buy in your area will see your home. Buyers find homes online from sites like Realtor.com even though they have realtors. Locating and searching properties is a small portion of today's Realtors' job. Internet marketing and social media marketing changed everything. Your Listing Agent needs to understand who the target buyer is for your home and use appropriate channel to get the maximum exposure. Your buyer may be using Instagram instead of Facebook, or Pinterest. Your buyer may not be using internet, but searching homes on the paper or real estate magazines. it is all about marketing and that depends on the individual not the big brick and mortar company. How do you provide superior service with this low listing fee? It’s SIMPLE. I accomplish this by working with experienced partners who work full time and by eliminating unnecessary expenses such as fancy offices and other corporate frills. 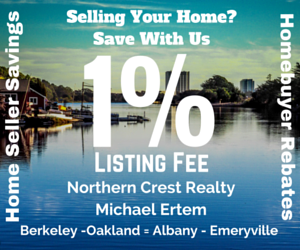 Being efficient allows me to pass my savings on to you in the form of our 1% LISTING COMMISSION!.